Without that, potential homebuyers and renters make the mistake of “saving” money by buying a home far outside the city, only to see those savings vanish when they end up driving multiple cars hundreds of miles per week, racking up fuel and maintenance expenses. The H+T index is a simple tool for making better decisions — for families, for planners, and for the federal government. Today, U.S. DOT and HUD announced that they’re launching a new version of H+T. They’re calling it the Location Affordability Index, and CNT helped develop it. LAI differs from H+T in some key ways (here’s an infographic detailing those differences) but at its root, it gets at the same important question: Where is the best place to live without breaking the bank? 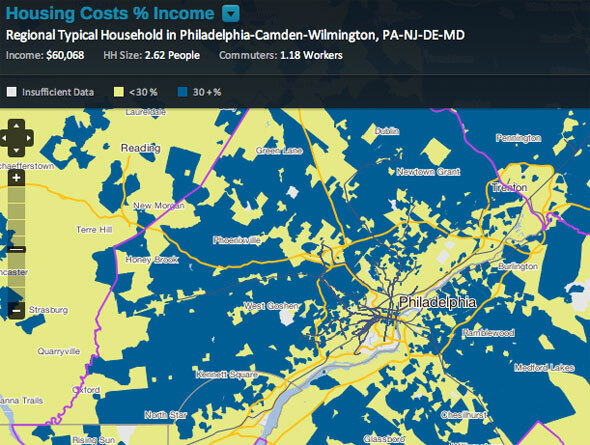 CNT answers that question by showing the huge variations between two maps: one that shows places where the median household pays 30 percent or more of their income on housing, and one that shows places where those households pay 45 percent or more of their income on housing and transportation combined. The maps show how intimately linked transportation and housing are when determining cost of living, as HUD Secretary Shaun Donovan told reporters today. “For any housing community to succeed, its residents need to be able to get to work, its young people need to be able to get to school, and its families need to be able to access critical resources and services they need,” Donovan said. Areas farther from the city center no longer appear affordable when transportation costs are factored in. Donovan noted that for most families, transportation is their second-highest monthly expense, after housing, but said transportation costs aren’t always so easily tabulated. You don’t get one transportation bill in the mail, the way you get your mortgage or rent bill. Transportation costs are paid in dribs and drabs — a tank of gas here, a bus fare there, a parking ticket, a taxi ride, an oil change. The LAI index helps quantify how those costs add up, and see if the transportation requirements of a particular geographic area render it unaffordable. Of course, the availability of transportation options and the ability to see average household expenditures doesn’t necessarily tell a family with certainty what they’ll spend. But it opens up that conversation and invites people to calculate those sometimes hidden costs. The agencies are calling the new portal a tool for families, housing counselors and community planners to make better decisions — but they want to see it “road-tested” before they put their full confidence behind it. U.S. DOT and HUD aren’t yet using the LAI themselves to determine how to direct grant money, where to build public housing, or whether to underwrite a mortgage. It’s good enough for local policymakers to use, they indicated, but not the federal government. Still, if this tool could have helped avoid some foreclosures during the depth of the housing crisis — or could help prevent a repeat — that sounds like an argument for a federal interest in using this metric. What kind of lag are we looking at with the data? I have to figure that transportation costs must be becoming (proportionately) less of a factor with the advent of Housing Bubble 2.0. This calculator looks like a great tool, particularly as it forces you to think about the various aspects of transportation costs. It is, perhaps by necessity, a vast oversimplification of the problem, but it is still very enlightening. I wonder how good the model behind it really is, since it is a bit too tedious to enter the different vehicle and transit costs for the various locations a family may actually be considering, so I suspect most would just rely on their “similar household” calculation. This is unfortunate since the calculator is most useful when taking the time to thoughtfully input your own information. As for this similar household, it seems to be rather poor could use some improvement. I tried playing around with some numbers and found that the model was not nearly responsive enough to certain factors. For example, at my location a household with 2 commuting adults and 2 kids earning $50,000 would be expected to spend $24,000 on housing, while the same household earning $100,000 would be expected to spend just $27,000. I think in reality a household earning that much more would trade up to a bigger/nicer apartment. Housing costs also did not vary from one location in NYC to another (even across boroughs), so it seemed to be drawing on averages over vast geographic areas. The tool also did not allow one to put in the work locations and “auto-calculate” the cost of commuting there either by car or transit (perhaps that is too hard a calculation, but it is very important, as some may not even realize how much cheaper it is to switch to transit). Finally, the tool did not take into account the single biggest factor in my decision to move closer to work: opportunity cost. Time spent commuting is time not spent with the family or advancing at work. THAT is a major cost for me. Excluding that cost, the calculator shows I should probably be living in the suburbs. Agreed. 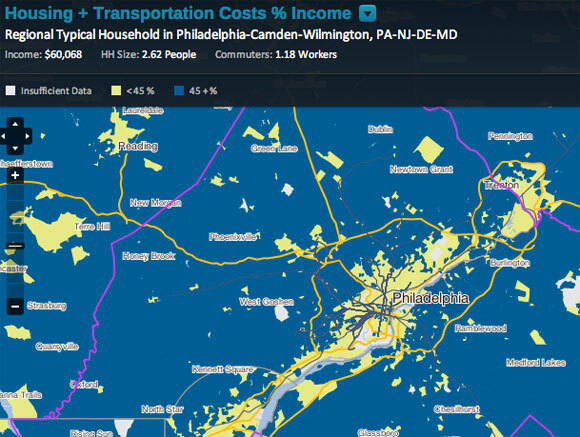 The new tool–the Location Affordability Portal, which is not linked to here despite it ostensibly being the subject of the post–has a much more informative interface and includes a transportation cost calculator for use by individual consumers. You can check it out at http://www.locationaffordability.info. The Location Affordability Index is based largely on 2006-2010 ACS data, so there may be some discrepancy between current housing costs and housing costs reported by the Index. However, it is still useful for comparing the combined cost of location across a given region for a given family. When using the cost calculator, the user can override the Index’s suggestions with more recent numbers if she or he wishes. Oops, just an oversight. Fixed! Thanks for catching that. It appears my previous reply to you has been deleted, but I completely agree. HUD and DOT’s Location Affordability Index shows show the complete range of combined housing and transportation cost burdens for eight different household profiles, not just whether or not a place meets a predetermined standard of affordability. This makes it a more detailed and informative resource. Moreover, the data behind the Index is available for download. You can read in detail about the data, modeling and computation behind the site on the Technical Documentation page (http://www.locationaffordability.info/About_TechDoc.aspx). All Index data is calculated at the Census block-group level. I’m a bit confused by your comments about the calculator. When you add a second address, it brings up a second calculator screen that populates with your previous entries. Presumably, your vehicle ownership costs would be similar providing you would own the same number of cars in different locations (your transit costs would differ more most likely). Your question about the marginal impact of increased household income on housing costs in a given location is complicated by what kind of housing stock actually exists in that location. For example, it may be the case that smaller or lower-quality units do not exist in your location, meaning that lower-income households who want to live there are paying almost as much of a premium as higher-income households. In terms of the cost of commuting, you can enter your address(es) of employment in the Driving tab by clicking the calculator button, which will give you a more precise estimate. Valuing commute time is a tricky business, given that different people value their time differently and different modes of transportation have different opportunity costs. For more on these issues, you can look at the Additional Considerations section of the Development page (http://www.locationaffordability.info/About_Development.aspx#Additional). 2010, as @disqus_edmkMIU4Ll:disqus describes. Center for Neighborhood Technology (CNT) says in the graphic that describes the differences that their Location Efficiency tool (I’m not sure how that’s different from Location Affordability) that 2011 data will be coming soon. 1 & 2: Less than and greater than 30% for housing costs as a percentage of income (Blue and Yellow). 3 & 4: Less than and greater than 45% for housing + transportation costs as a percentage of income (also Blue and Yellow). The site needs a permalink feature so I can link to specific locations (and easily refer to them later). Otherwise, it’s a great tool for quickly understanding some basic characteristics of different neighborhoods in Chicago that can direct one’s further research on matters like housing and car ownership. location (transit costs will vary more). Your question about the marginal impact on housing costs of increased household income is a difficult one, because the cost of housing is mediated by the available housing stock in any given area. For instance, areas such as yours where housing costs do not vary very much by income may not have smaller and lower-quality units, so that any lower-income family who wishes to live there would be forced to pay almost as much as a more affluent family. If you click the calculator button on the Driving tab, the cost calculator does allow you to input your family’s employment address(es) to get a more precise estimate of how much you drive. As you mentioned, the site does not take the value of time into account. Valuing time is a tricky business, as different people value their time differently and different modes of transportation could have intrinsically different opportunity costs. For more on these complex issues, you can check out the Additional Considerations section on the Development page. Josh: I’m not sure why your comments aren’t showing up, so I’m posting my response here. I had a look at that technical documentation, and it is quite extensive. It really shows the amazing amount of thought and effort put into this calculator. So kudos to you for putting it all up there, and for responding to my comments here. Let me say again before explaining my criticism that I think the tool is very well done and that simplifying the problem is necessary to getting anything done. I hadn’t noticed the VMT calculator based on workplace. It looks helpful for figuring out my own VMT, but I was referring more to changing the “similar household” estimates based on such data. You’re right about the housing cost. I hadn’t noticed that it copied the information. In fact, the results do change. Nevertheless, the result shown is a bit puzzling, since it shows housing to be cheaper in my current neighborhood, the Upper West Side, than my previous neighborhood, Riverdale, whereas I know for a fact that it is roughly twice as expensive on the UWS. This is a pretty big discrepancy. Also, both neighborhoods have families of 4 like mine living in anything from converted 1 BR apartments to sprawling 5 BR townhouses, so the lack of diversity in housing choices is not a factor in either place. It appears the calculator tops out at a monthly suggested rent of $2250, whereas in my neighborhood you could barely get a studio in a walkup for that price. Not sure if this is a bug or by design. I’m also not sure how you would account for this, but you are not comparing apples to apples if you look at how typical households live in different places. After all, people definitely live in smaller apartments in the city, but this is not because they like smaller apartments. To be fair, one should compare the same size apartment in the city and the suburbs. The main reason I hear from friends who move to the suburbs is not that they wanted to save money, but that they needed more space. Again, all these issues may be avoided by overriding the suggestions. I’m just saying the suggestions could be a bit better. As for measuring opportunity cost, you are already making all sorts of assumptions on things like proportion of VMT spent on social trips vs. commute, so why not toss in some assumptions regarding value of time spent commuting? I can’t quote them off the top of my head, but there are actually credible studies on this topic, and it is far from an insignificant factor. Like anything else, you could provide an option to override some standard estimate with your own estimate, perhaps expressed as a percentage of income, perhaps giving different suggestions as a function of commute mode. Personally, I figure 1 additional hour spent commuting per year is worth about 0.02% of annual income. Thus, figuring my wife and I commute 230 days per year, reducing the round trip time by an hour for each of us is worth 4.6% of our combined income. This 4.6% tips the scales in favor of the city over the suburbs for us, despite the significantly higher cost of housing. It looks to me like the lack of permalink is by design, as to do otherwise would present a privacy issue. I’d like to at least link to a block group, if not a particular “house”. Yes, would that more recent data was available at this level of geographic granularity, but it is not. 2007-2011 ACS is coming out soon though. You should note that transportation costs are much less volatile than housing costs because they are so heavily influenced by fairly static aspects of the built environment–transit and employment access, population density, and intersection density. Sorry about that — some comments got caught in the spam filter. Are There Any Affordable Cities Left in America?